Gold has become an attractive hedge against currencies since the unfolding of the 2008 financial crisis, and increasingly, emerging markets are showing interesting in owning gold as part of their reserves. Russia continues its gold buying spree, adding 0.3 tonnes to its 996.4 tonne stockpile, marking a nine month increase, according to the IMF’s June statistics report. Russia’s Central Asian neighbours followed suit in June - Kazakhstan boosted reserves by 1.4 tonnes to a total of 130.9, Azerbaijan added 2 tonnes for a total of 8 tonnes, and Kyrgzstan, which bought less than 0.1 tonnes to total 3.3 tonnes. Ukraine, Greece, Belarus and Bulgaria also added small amounts to their gold reserves. Gold slumped 11 percent in June, the biggest drop since September 2011. The metal has already recovered 9 percent in July. Russia has the world’s seventh largest gold and silver holdings, excluding the IMF. In May, eight percent of Russia’s official reserves were gold, and President Putin continues to buy nearly half a billion dollars worth of gold each month. One of the world’s largest gold exporters has more than doubled its gold stockpile in the last 5 years. Germany, the world’s second-largest gold holder, decreased its stockpile by 0.8 tonnes to 3,390.6 tonnes in June. Mexico continued to decrease its gold holdings, along with the Czech Republic, Denmark, Costa Rica, Zimbabwe, and Guatemala. Turkey, which has the world’s 11th largest gold reserves, decreased its gold reserves for the first time in a year, shedding 3.8 tonnes for a total of 441.5 tonnes. Gold was heading for at least a 9 percent increase in July, as it advanced on the expectation the Fed would continue their stimulus measures, but Monday fell in anticipation of Tuesdays’ Federal Reserve Open Market Committee meeting, which will shed more transparency on the US plan to taper their bond-buying program, undermining the appeal of gold investment. Spot gold fell 0.7 percent to $1,323 early Monday, but has recovered to 1,332.85 at 14:24 MST. Spot gold dropped 1 per cent to $1,320 on Friday. “Prices are unlikely to maintain their upward momentum in the seasonally weak period for demand unless US macro data deteriorate, driving further short covering-led support,” Barclays analysts wrote in a note, Reuters reported. 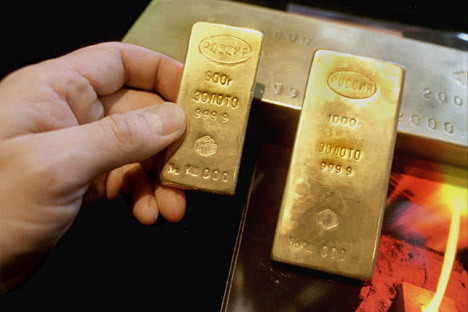 Over the last decade Russia’s Central Bank has acquired 570 metric tonnes of gold, making it the world’s biggest buyer. The gold accumulation is part of a larger effort to diversify Forex reserves as well as strengthen the rouble. Russia has over $513 billion in foreign currency and gold reserves, according to the Central Bank’s June report. This figure is down compared to the $527 billion in reserves the Bank held in March 2013. The amount of gold was omitted from the report. Gold plunged 14 percent in April and hit a 30-year low, as the rising prices of commodities have superseded demand.